Day 163 - Working gyroscope! I don't know why, but I haven't had much luck 3D-printing gyroscopes - either from Thingiverse or that I designed myself. It really shouldn't be that hard, but somehow the prints were either too loose or too tight, and I sort of gave up for a while. 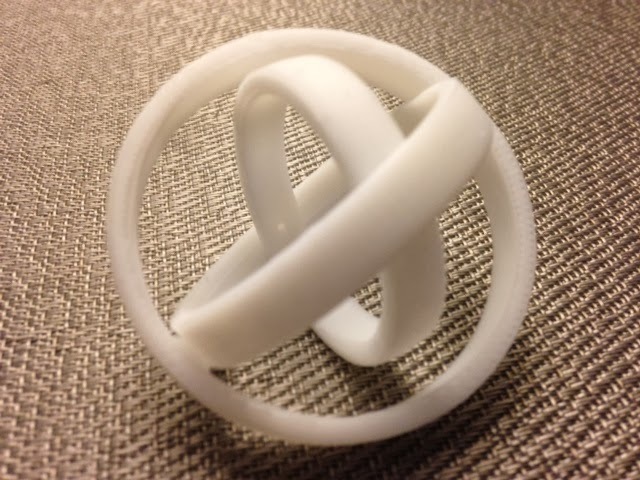 Today we gave it another go with althepal's Another parmeterized gimbal model on Thingiverse, and success! Thank you, althepal, for making such a nice model. Settings: .3mm/low on an Afinia H-Series. Technical notes: We used althepal's sample file rather than the Customizer. Tomorrow, we Customize!